To download this article as an Adobe Acrobat (pdf) file, click here (640 KB). Usually our articles on the history of physics describe ideas or people whose contributions to our modern views is obvious and direct. Here's an article about a very intelligent and influential thinker, a contemporary of Newton who was familiar with the Newtonian world view, who nevertheless saw and described experience in a way that we now consider to be very strange and unproductive. All of us who teach physics should be aware that our modern science is a very thin veneer, and that its methods and assumptions are not universally held or apparent. Because the rationalist cosmologies lacked the ingredients of mathematization and experimentation their impact on the development of physics is indirect. (For example, the vortices of Descartes are generally not discussed in a physics curriculum today.) Yet the natural philosophers did provide a sphere of inquiry and speculation out of which modern science flourished. And furthermore, in as much as the modern physicist desires to see beauty and coherence in nature he exhibits characteristics of a rational cosmologist. In this paper we present a rationalist cosmology developed by the 18th-century Swedish philosopher Emanuel Swedenborg, together with a biographical note. Some commentary will be made on the relation of Swedenborg's ideas to contemporary views of nature. In following this program we hope to contribute to an increased awareness of our intellectual history. Apparently Swedenborg was quite bright and entered the University of Uppsala (Sweden's preeminent university) at the tender age of 11, in the year 1699. At that time Sweden was somewhat removed from the main intellectual climate which shaped ideas in the more southerly parts of Europe, but in 1649 Queen Christina had persuaded the famous rationalist Rene Descartes to join a group of leading intellectuals which the queen was forming in Stockholm. Although Descartes died the following year, "as a result of the Swedish climate and the rigorous schedule demanded by the Queen,"3 his ideas soon generated controversy between the theologians and the more liberal minded philosophers. When Swedenborg arrived at Uppsala the atmosphere had cleared somewhat with the faculties of medicine and philosophy (the latter including science and mathematics) able to pursue their research less impeded than in the past by men of theological orthodoxy. Swedenborg enrolled in philosophy and, during his ten years stay, studied Latin, Greek, Hebrew, classical literature, mathematics, and natural science. At his graduation in 1709 he read his thesis entitled "Selected Sentences from Publius Syrus Mimus and L. Annaeus Seneca," typical in that it defended one of his professor's classical views. The work follows in the footsteps of his father's classical approach rather than anticipating Swedenborg's later studies in science. As was the custom of those times, Swedenborg followed his formal education with travel abroad, especially to England where he was to stay two and a half years. He found lodgings in the homes of tradesmen: a watchmaker, a cabinet maker, and later a manufacturer of brass instruments. Swedenborg studied these men's crafts and increased his proficiency with the English language until he felt ready to use his letters of introduction to some of the noted English men of learning. He spent a great deal of time with John Flamsteed, the royal astronomer and director of the Greenwich observatory. During this period one of the great practical problems was the determination of longitude when navigating at sea and the young Swedenborg took up the challenge with energy. He proposed a method based on lunar positions but the appropriate tables were not available and his scheme was held to be impractical. One could hardly be interested in scientific studies in England of the early 18th century without being cognizant of the Principia of Isaac Newton. Uppsala, on the other hand, was still essentially Cartesian in its view of the universe, a completely filled universe with continual circular and vorticular motion of all its parts. Cartesian philosophy had no place for the Newtonian vacuum or the action-at-a-distance type of force suggested by Newton's theory of gravity. While in England, Swedenborg did study Newton's work. In correspondence with his brother-in-law, Eric Benzelius, Swedenborg wrote, "I read Newton daily and I wish to meet and to hear him. "5 Then later, in discussion of the longitude problem, Swedenborg reported (possibly referring to Book III of the Principia) that "Newton has laid a good foundation to regulate the irregularities of the moon; he has not, however, given out tables but a bare theory. "6 The tables he wanted were probably those needed to make practical Swedenborg's own solution to the longitude problem. Later one of Swedenborg's professors at Uppsala wrote to him asking "What the learned mathematicians think of Newton's principles concerning the motion of the planets, inasmuch as they seem to be pure abstraction and not physics, namely as to how the one body of the planet shall gravitate to another, etc., which seems to be unreasonable. "7 Swedenborg sent a reply through a letter to Benzelius, "Prof. Elfvius asks the judgment of Englishmen concerning Newtonii Principia, but in this matter may no Englishman be consulted because he is blind when it comes to his own countrymen and it were a crime to bring them (Newton's principles) into doubt. "8 Perhaps this last quotation reflects Swedenborg's growing frustration with the lack of acceptance for his longitude solution among English scientists. Despite this exposure to Newton's work the very different Cartesian view was to remain a primary influence in Swedenborg's cosmology. Swedenborg eventually left England for further travel and study in France and Holland. In Holland he learned the art of glass grinding for the purpose of constructing a microscope. He was especially impressed with the newly built brass quadrant at the observatory in Leiden, and hoped to return at a later time to make a series of lunar observations to establish his solution to the longitude problem. Upon his return home Swedenborg contributed significantly to the vitalization of scientific life in Sweden. In 1716 he began publication of Daedalus Hyperboreus, Sweden's first scientific or technical journal. As well as presenting many of Swedenborg's projects this journal included the inventions of Christopher Polhem who was Sweden's foremost mechanical talent at that time. King Charles XII took official note of Swedenborg's mechanical interests by appointing him to the Royal Board of Mines as assessor extra ordinem.9 During these next two decades Swedenborg published many works, ranging from short papers to books, such as his Algebra (the first algebra book published in Swedish. )10 His views on the physical world eventually crystallized in a work entitled Principia and subtitled The First Principles of Natural Things11 published in 1734. It is this work, containing the general outline of Swedenborg's cosmology, which is described in the next section. Swedenborg's cosmology is a description of nature from two perspectives which are then related to each other. First he pictures the microscopic world as a system of elementary corpuscles or particles. Then this microscopic world is incorporated into a model of the evolution of the solar system from the sun. The physical world is considered to be arranged in levels of increasing complexity. At the deepest layer Swedenborg proposes a starting point or link connecting the material and immaterial worlds. This connection is labeled the "First Natural Point"—natural because it is of the material world and a point in the sense of a mathematical point. Swedenborg has trouble formulating a precise description of this Janus-like object which faces both the physical and unphysical world simultaneously. The first natural point plays a role even more fundamental than the atom of Democritus or the monad of Leibnitz. This first entity is barely material, a primitive concept which stands beyond definition. Yet as a starting point it is, in Swedenborg's view, a philosophical necessity. Once the first natural point is established the various levels can be built up. The major categorization is in terms of the "elements" shown in Fig. 1 where the evolution of the solar system starts to become evident. Stellar objects in general and the sun in particular are composed of "first element particles" in a state of extreme vortical motion. The grosser elements of nature emanate from stellar objects, eventually giving rise to the elements of air and vapor which are considered to be primitive substances for the planets. With this hierarchy in nature, Swedenborg seeks not only to explain the deeper levels but also to give a geography to the levels. Fig. 1. Hierarchy of elements in Swedenborg's cosmology. The concentric circles are meant to illustrate two features. First the idea of levels in nature is represented, somewhat analogous to a modern hierarchy such as proton, nucleus, atom, molecule, and so forth. 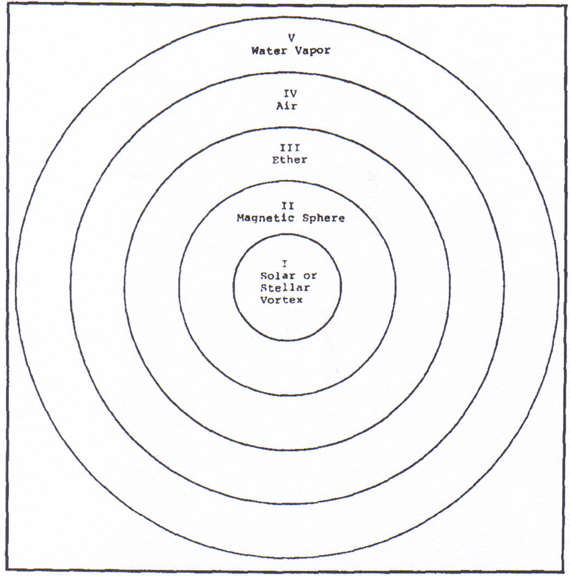 Second, the circles indicate Swedenborg's geography of the solar system in which planetary material of elements IV and V is separated from the stellar material I and II, by an Ether element. Swedenborg's terminology is used for labeling the elements. Click on image for a larger version. While the main ingredients of Swedenborg's cosmology are the "elements" which have their origin in the first natural point, there are also intermediate substances or building blocks which help to generate the series of elements. 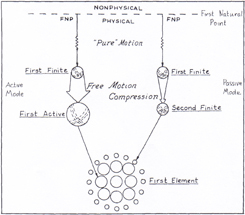 The first natural point is a mathematical point and therefore Swedenborg suggests a transition particle called a "finite" which develops from the motion of the first natural point. This finite is the first thing which is definitely placed in the material world and, unlike the first natural point, the finite is definitely considered to be a physical object. In the construction of the "first element" Swedenborg is not content to simply lump finites together. Instead he postulates inner and outer sections of the element particles and suggests that these parts are composed of finites in two different modes. As represented schematically in Fig. 2 the finite either occupies a larger volume in space through high speed motion or it may (by an unstated mechanism) be compressed to a "passive" state referred to as the "second finite." The latter mode for the finite makes up the covering of the element and the former "active mode" provides the element's interior substance. In this way Swedenborg achieves structure for his first or solar element. Fig. 2. Development of the first element from the first natural point. 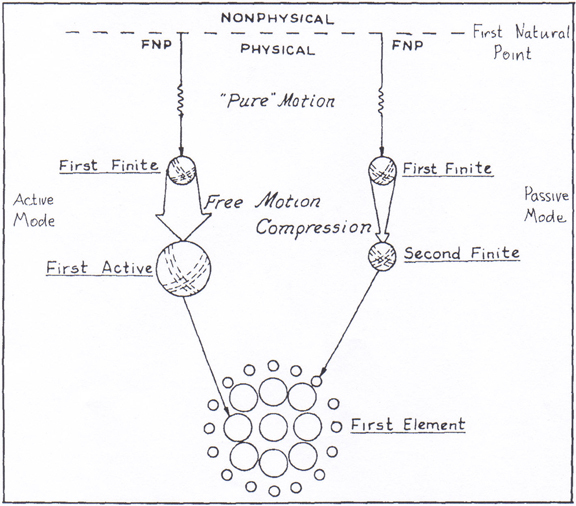 The finites are generated by the "pure motion" of the first natural point. In turn, the finites become the components of the element. The first element undergoes modification to become a grosser finite which will be part of a grosser element. The process continues in this manner through the construction of the five elements. Click on image for a larger version. Swedenborg also uses the notion of the finite as an intermediate step for the construction of the other elements. However, he supposes that the more interior elements become the finites, again in active and passive modes, for the composition of the grosser elements. (As before the mechanism for the modification of the finites into their modes is not specified.) In this way a chain of compound elements is developed from the stellar particle down to the vapor particle. Like others, Swedenborg viewed motion as a fundamental property of the universe. He first introduced a kind of potential motion or "pure and total motion"12 for his first natural points. However, this motion is hardly physical since the points themselves are more metaphysical than real. Nevertheless it is the motion of these points which apparently generate the shape of the finite particle as shown in Fig. 3. This figure depicts a spherical envelope as the outer boundary of the finite as well as a spiral motion which goes into a vortex at the poles as the motion continues inside along the axis of the poles. Swedenborg describes the shape as having "an equator, ecliptic, meridians, and their perpendicular circles. "13 Probably his earlier work on the longitude problem had a pronounced effect on his notion of the appropriate geometric form. Fig. 3. An inside (a) and outside (b) view of the geometry of the finite "particle" as found in the Principia (reference 7, Vol. I, p. 173 and p. 191). These two diagrams were reproduced in the work by J. G. Burke, Origins of the Science of Crystals (University of California Press, Berkeley, 1966), p. 47; but were identified differently as an element and active respectively. However, the discussion on pp. 189192 of the Principia seems to support the present interpretation. Click on image for a larger version. The general form of the motion in the grosser elements and finites seems to be approximately the same as that of the first finite particles. However, as more particles aggregate in the grosser elements there is a compression of the constituent particles and a subsequent reduction in the energy of the motion. For example, the solar-element particle would be much more active than the vapor-element particle. However, the entire schema is based upon continual and connected motion by all the parts, a kind of dynamic equilibrium. Fig. 4. Planetary evolution. A series of diagrams taken from Sedenborg's Principia showing the general features of his theory. 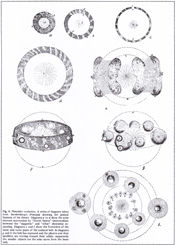 Diagrams a to d show the solar element surrounded by "fourth finites" (intermediate between the "magnetic" and "ether" elements) expanding. Diagrams e and f show the formation of the inner and outer parts of the zodiacal belt. In diagrams g and h the belt has ruptured and the planets and their satellites are moving toward their orbits. Apparently the smaller objects are the solar spots from the inner belt. Click on image for a larger version. It is clear, even from this brief description, that Swedenborg's structure of elements does not fit, in any exact sense, the models of present-day elementary particle physics. 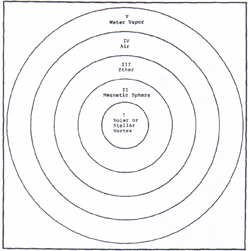 Furthermore, his theory of planetary evolution, based on the elements seems vague and lacking in empirical support. However, Swedenborg's work should be viewed in the context of the contemporary natural philosophy, and most noteworthy in this regard is the essential agreement of Swedenborg's rational cosmology with the previously developed Cartesian world view. Both Descartes and Swedenborg proposed a filled universe or plenum of several elements. Both men described mechanisms for planetary evolution, with special emphasis on the vortex as a primary motion in nature. There are limitations in Swedenborg's work on natural philosophy. His style of writing is often lacking in clarity, at least from the viewpoint of the modern reader. Perhaps more surprising is the fact that despite his admiration for Newton, Swedenborg does not incorporate Newton's methods or ideas into his work, and his attempts at mathematization of concepts are unproductive. Furthermore, the Cartesian influence is so clearly evident in the Principia that it is often difficuIt to delineate the extensions and modifications which are Swedenborg's own. Yet these shortcomings do not erase the value of the original contributions he did make. By 1740 Swedenborg seemed to have lost interest in the exclusive consideration of the physical world. He turned to medical sciences concentrating on the blood and especially on the brain. His work on the cortical localization of mental activity, the importance of the pituitary gland to the body's economy, and general observations on the nervous system are regarded as important developments in physiology.23 In all this effort Swedenborg was particularly concerned with the connection of the finite to the Infinite—a connection alluded to in the Principia but now approached through a consideration of human neurology as the biological foundation of the human soul. In the final period of his life, from about 1745 to 1772, Swedenborg dropped his scientific work altogether and concentrated on religious studies, the effort for which he is best known today. I would like to thank Professor Albert Moyer for his useful suggestions and Dr. Erland J. Brock for his valuable commentary. 1 J. H. Gaisser and T. K. Gaisser, Am. J. Phys. 45, 1977, p. 439. 2 René Dugas, Mechanics in the Seventeenth Century (Central Book Co., New York, 1958), Chapters 7, 9, 14. 3 Bernard Williams, in The Encyclopedia of Philosophy, edited by Paul Edwards (Macmillan, New York, 1967) Vol. 2, p. 345. 4 Eman. Swedberg, Forsok at finna Ostra och Westra Lengden igen igenonm Manan, Uppsala, John Heinrich Werner, His Royal Majesty's and Uppsala Academy Printer, 1718, Dedication. 5 E. Swedenborg, in Letters and Memorials of E. Swedenborg, translated and edited by A. Acton (SSA, Bryn Athyn, PA, 1948), p. 13. 9 I. Jonsson in Encyclopedia Brittanica, 15th ed., Vol. 17, p. 885. 10 James Hyde, A bibliography of the Works of Emanuel Swedenborg (The Swedenborg Society, 1906), p. 25. 11 E. Swedenborg, The Principia, translated by J . R. Rendell and I. Tansley (The Swedenborg Society, London, 1912). 12 Reference 11, Vol. II, p. 61. 13 Ibid., Vol. I, p. 94. 14 Ibid., Vol. II, p. 174. 15 Ibid., Vol. II, p. 183. 16 Ibid., Vol. II, p. 184. 17 An English translation was prepared by Edmund Stone in 1726, on the basis of the second Latin edition of Gregory's work. A 1972 reprint, The Elements of Physical and Geometrical Astronomy is available from Johnson Reprint Corp., New York. 18 Reference 11, Vol. II, p. 167. 19 R. Descartes, Principia Philosophiae (1644), Book III, Numbers CXIX and CXLVI. There is a French edition edited by C. Adams and P. Tannery, Oeuvres de Descartes (Librairie Philosophique J. Vrin, Paris, 1964). 20 E. Kant, Universal Natural History and Theory of the Heavens, 1754, translated by W. Hustic (University of Michigan Press, Ann Arbor, 1969). 21 Svante Arrhenius, The Life of the Universe, translated by H. Borns (Harper and Brothers, London, 1909). 22 But note the following quotation: "Not until the middle of the eighteenth century did astronomers consider the possibility that the stars might be arranged into a system of one or more 'Island Universes.' The very remarkable works of Thomas Wright, Immanuel Kant, Jean Lambert, and an even earlier work by E. Swedenborg, are by now too well known [italics added] to require more than mention." From J.D. North, The Measure of the Universe (Oxford University Press, Oxford, 1965) p. 3. 23 J. H. Talbott, Journ. of Am. Med. Assoc. 206, 1968, p. 87, and also K. Akert and M. P. Hammond, Medical History (London), 6, 1962, p. 255.